I've wanted to use this quote (Quietfire Design) ever since I got it about a month or so ago. Love it, but I didn't have the image I was envisioning using... Then I was checking out the last of the Scrolls Works stamps (they closed their rubber stamping doors...) and there it was. I knew that was the one I wanted to use. BIG GRIN. So since it was a Victorian image (in my mind anyway), I wanted a small type of flowery type wallpaper. And that's how the background came about. Anyway, if you want to see more details and descriptions etc, just click on card image. Enjoy. 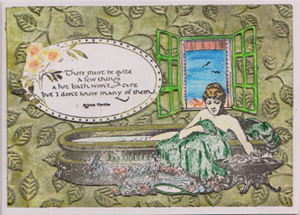 And the Created By Hand and Quietfire Creations Challenge this week is "Shades of Green". PS All 4 stamps and the embossing folder are new - never been used before. Creatalicious Challenge #24 1920's, vintage etc. What a gorgeous card. I love the image. Thanks for joining us at Aud Sentiments. What a great card! Thanks for joining the ‘Anything Goes’ Challenge’ at Digi Doodle Shop Challenges. We hope to see you again next week! I could just hop into that bath myself it looks so inviting. Love what you have done to the card. Thanks for sharing with us at Digi Doodle Shop Challenges. Lovely card! Thanks so much for joining the Pixies this week! GORGEOUS Yogi!!! love the background!!! Thank you for playing along @ Aud Sentiments! Love the quote- i've been wanting to use it to. perfect image. Wonderful card, Yogi!!! You found the perfect image to go with Suzanne's stamp!!! Love your wall paper:0) What a nice scene you have made! I love it. What lovely artwork to add to a bathroom. Gorgeous, Yogi! Love the victorian era! Thank you for playing along with us at Stamp Insanity. Great card - love the quote! Thanks for joining us at The Crafty Purple Frog Challenge! GORGEOUS and a fabulous image!!! Thanks for joining us at Creatalicious! !